Join Us!!! We are looking for someone to help us cover African Championships basketball. Please send us an e-mail. ANGOLA: Afonso Silva, Walter Costa, Angelo Victoriano (5),Walter Monteiro,Edmar Victoriano(20), Victor Carvalho (13),Joaquim Gomes(2), Victor Muzadi, Abdel Moussa (6), Carlos Almeida (14), Miguel Lutonda (15) and Jean Jacques (10). Angola is again African champion. Beating Nigeria in the final by 85-65, Angola is again in olympics representing Africa. Senegal- Mohamadou Diallo 20, Boniface Ndong 17, and Babacar Cisse and Kadir Pene with 10. Egypt- Ismail Ahmed 20, Ahmed Mounir 17, Ramy Gunaidi 13 and Haytham El Saaid with 10. 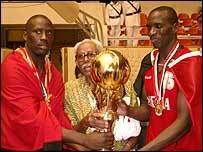 Beating Senegal by 2 points, 81-79, Egypt is the 3º of the Africa championship. Angola and Nigeria will play for the gold medal after easy victories in the semis. Undefeated Angola beat easily host Egypt, while Nigeria defeated Senegal without big problems. Cent. Africa took 6th place and Tunisia is No 7. Angola showed more mature basketball. The team is based on very experienced players, who play on international stage for many years. That could easy give them another championship of Africa. Nigeria won Group A despite one game lost to Algeria. They will face Senegal in the semis. Central African team gave the another strong hit to Algeria. Algeria, one of the top favorites of the tournament, lost 3 games in 3 days. The Algerian selection was severely corrected, Tuesday evening, by the Central African Republic while being inclined by 87 to 69 at the time of the 5e and last day of the 1st turn of the championship of Africa of the nations of basketball. It is the third consecutive defeat of the Greens in this competition which was worth to him to it little enviable 4e place with the general classification with 7 points. The foalta of Labouize however started well the tournament with two victories against Mozambique and Nigeria before bending during the last three matches to see itself definitively eliminated with a mitigated assessment. The national trainer explains the defeat vis-a-vis with the RCA and this fall of mode at the end of the tournament by tiredness after an intensive series of matches. It will say in substance: "We played with moral low after our elimination yesterday following the defeat of Egypt vis-a-vis in Nigeria. The absence of Benramdane and Sayah as well as the tiredness of the players after an intensive series of matches weighed in the balance. "Indeed, the Algerian team, which was to gain to finish 3e group A and to play the 5e or 6th place, completely missed her exit. Deprived of his marker appointed Benramdane, the five Algerian took a good lead (15-9) until the 8th minute, before undergoing the attacks of the Central African players, more motivated and skilful in the shots outside the zone of the 6,25 m. The RCA succeeded in making its delay and finishing the half-time with its advantage with 8 points in advance (40-32). This variation grew hollow at the time of the third quarter-time until reaching 22 points. At the time of the last quarter-time, the Greens returned to the load thanks to the success of Adrar, but without managing to level the mark, letting the Central African Republic spin right towards the victory. Algeria finishes 4e thus and will face Friday on behalf of 7th and 8th places Morocco. After this poor service, the Algerian national team of basketball could make the dead end on the next African plays which will take place of 1st at October 15 with Abuja (Nigeria). According to parvenu echoes' of Alexandria, the persons in charge for the basketball decided to withdraw African plays. Host team had to win this game to make it to the play-offs. So no surprise that they put a preassure from first minutes, ending the game with 28-points victory over Ivory Coast. But now a tough task: they will meet Group B leader, undefeated Angola (defending champion) in the semifinals. Great disillusion in Ivory Coast. The national team only win a single game. "Far from representing the Côte.d'ivoire with dignity, the formation of the Ivory Coast went to the country of the Pharaons to make tourism." said one of the most important Ivory newspaper. The criticize the president of the federation had not become to wait, "Making Egyptian campaign a failure on the sporting level.However, it would have made it possible the selection to make good tourism. As wanted it the decision makers of the team. " It was an easy "practice" for Angolan team, which was two levels better than their opponent. Angola will meet host Egypt in the semis. The forward Víctor Carvalho is the best three points of the African championship of basketball , whose regular phase was concluded tuesday in Alexandria (Egipto). The only player of the Petro de Luanda to integrate the national team of Angola have 16 three points shoots and is followed by the Senegal player Ndoye el Haji with 16, and the Ivory Coast Tape Eric (12). As the better Angolan one in the competition of launchings of long distance is Gerson Monteiro with seven, that it occupies 11ª position. Carlos Almeida (6) and Miguel Lutonda (6) are in 18º and 19º, respectively. Víctor Carvalho comes back to appear between the best ones, of this making in the nineth position of the relation of the best markers of the championship, with 62 points, the three points of its compatriot Miguel Luonda, who is in 11º, come in 14º Jean Jacques (58). Best scorer of the competition is the Central African Romain Sato (101). Gerson Monteiro is still the best in assists, with eight, less six that the Senegal player Cisse Babacar, to lider of the list, seconded for the Ismail Egyptian Amhed (10). Another Angolan name that appraises in prominence the handle of the first stage of Afrobasket 2003 is Abdel Boukar, that is the room best in steel shoots with eight, while the first one placed, the Egyptian Ibrahim El-Adawy, has 17. Edmar Victoriano "Baduna" is seventh better in defensive rebounds with 26, 12 less than the Nigerian Oyedeji Olumine, who heads the list. Already in offensive rebounds, the list is led by one lusófono, the mozambique player Seven Muinga with 20, while Joaquin Gomes "Kikas" appears in the twentieth o more good marking Jean Jacques represents Angola in the competition of two points shoots when converting 19 , less 10 that lider of the list, Ndong Boniface (Senegal). In free throws, the best Angolans are in 12º Walter Coast (14), 13º Jean Jacques (14) and 18º Carlos Almeida (13). Here also best it is the Central African Romain Sato. The senegal player Babacar Cisse is best in "steels", competition who counts on one cries of Mário Palm, Baduna Victoriano, 11º with nine. In turn over, Baduna and Lutonda are distinguished with 13 losses each one. The national team finished without defeats in first place it preliminary group B and goes to face the Egipto in the stocking-ends, thursday. To another departure of this phase the Nigeria to the Senegal will oppose. Both teams already lost their chance for the play-offs. The final result was expected. The Tunisian team disputes this afternoon his last match in the championship of Africa of the nations, a match of classification for the 5e place after having missed the qualification to the semi-finals. It will face the Central African Republic, ground an enough team and which showed a honourable face in the group B. The situation is clear for the team of Tunisia: the weight of the absences was determining and prevented from fully playing its chances for the last square. But when one sees there more closely, the image becomes even clearer. The Tunisian selection cannot be prevailed of a performance whereas the possibility was present to pass in semi-finals. Angola and Senegal were not wild and unbeatable teams. Separately a handle of pros, they are local players who were present. In any event, the team of Tunisia could have beaten Senegal or Angola if it had had a better manpower. With only one playmaker and any pivot of position, it was quasi impossible for the Tunisians to beat Angolais or the Senegaleses. The winner of that game would go to the semis. So a tough game, where Senegal show more mature basketball. They will face Nigeria, Group A leader in the semis. Senegal credited twice with poor a seventh place at the time of the two last campaigns, especially did not force the ambitions after having known a bâclee preparation. These bad conditions of preparation whose must was the episode of the threat of boycott held up for questions of premium, finished convincing more the skeptics whom this team would still not make of the results this time. This pessimistic position was confirmed from the very start of the tournament by the defeat of the band of Babou Cisse against Angola (60-73). Bad starts followed thereafter by positive results in front of Tunisia and Madagascar before curving the spine with South Africa. One needed a start of pride against the Morrocans however credited with good performances and a victory of Tunisia over Bafana Bafana, to see the way of the semi-finals finally opening again for Senegal after an absence of two championships on this level (1999 and 2001). It is also the end of a guigne for their adversaries. The Nigerians who divided poule with the Lions at the time of the two campaigns had the privilege more to remain in the last square since 1997 in Dakar when they had been classified 2e behind the Lions. For them also, it is a return on the surprising front of the scene more especially as the Nigerians fell of entry with Algeria. A false quickly forgotten step since the fellow-members of Tunjie took again confidence by spreading out the victories with all their other adversaries of poule A. No more undefeated teams in Group A. A big surprise, while Algerian team was defeated by much lower ranked Ivory Coast. Cent.Africa (hungry for victories) has a very strong team, while many of their players play pro basketball abroad as well as in the US colleges. 45-points victory over Mozambique is very significant. A big sensation. Two games lost in two days for last tournament finalist Algeria. Not so many fans believed Ivory Coast could beat much higher ranked Algerian team. Egyptian fans were cheering too early after yesterday's victory over group favorite Algeria. Egypt, the only undefeated team in Group A lost to Nigeria by 3 points. Both teams have 3-1 record. No game hgistory. It would be a surprise if Madagascar wins any game at this tournament. 41-points victory over Morocco makes Angola the biggest favorite of the tournament. Who is going to challenge them? Small surprise. Senegal team had some well-known names, but team game of a team from South Africa brough them a victory. Game played at the Mubarak Stadium of Alexandria , the senegal lost his second game with 20 fault,45 rebounds (16 off and 29 def),8 turn over ,5 steal,2 blocks ,15 free throws for around 75%. A game of the day was a victory of host Egypt, over last event finalist Algeria. Very important game for the host team. They managed to beat strong Algeria. Algerian team was based mostly on pro players from France, while Egypt counted on the players from local league. Easy victory for Senegal against probably the weakest team at the tournament. Angola is on their way to the next title ? It only confirms that lack of pro league in South Africa influenced a lot of bad performance of that country on the international stage. All favorites won their games. However Morocco had some troubles with (theoretically) much weaker Madagascar, and Senegal struggled to have 4-points victory over Tunisia. The most interesting games were Nigeria - Algeria and Angola - Senegal. Algeria and Angola (two top teams of last championships) won their opening games. Both teams were based on professional players, who play in Europe and the States (also at the college level). Despite very strong roster, Nigerian team would have to make important improvements to their game if they do not want to have another disappointing African Championships. Angola, defending champion, managed to beat Senegal with comfortable lead. Senegalese team is always non-predictable. They have a number of highly ranked pro players, who play abroad. The only question every time is who of them would be willing to play for the NT. Host team did not give any chance to Madagascar. Madagascar is not well known team and their team is based only on domestic players, as Madagascar does not send to many players to play abroad.